Operational challenges requires expertise and experience to choose the right solutions. The solutions are often a combination of finding suitable equipment and use it appropriately. During hectic everyday operations, Jacobsen Elektro is the solution and implementation proficient partner. Jacobsen Elektro has extensive knowledge of the interaction of electric power systems and their individual components. We deliver quality products together with our services, giving customers a guarantee that their investments in new products will the best. Jacobsen Elektro takes on the task as main contractor for any size projects. We perform refurbishments and replacements of components to extend the lifecycle of the network. Customer seek to find a provider that meet the requirements for installation of simple and understandable, yet sophisticated relays with good measurement principles. Another requirement was that one should be a turnkey supplier of protection, engineering, testing and commissioning, as well asperforming new relay plans. Jacobsen Elektro AS met these requirements to the fullest and work started on the transformer station. RefleX line feeder protection relay with directional ground fault and the disturbance recorder was installed on all 11 kV bays, drawings were produced and our installers who at the same time tested and commissioned the assembled relays. While working on the network, Jacobsen became aware that there was a need to change the transformers Automatic Voltage Regulator. It was replaced with a REG-D from A. Eberle GmbH, our partner on this type of equipment. Due to the limited lifetime of the NEBB IKA, it failed, and was put out of operation. It was also decided to change the distance protection as they were of the same production period. This was in a 132kV network where there was also a need for a Wisher protection relays. For this reason, the customer decided to upgrade to restore functionality in the network. It was also fitted new distance protection relay and a Wisher protection relay. Jacobsen Elektro represents products from A. Eberle GmbH of Germany. We have delivered more than 60 automatic voltage regulators, AVR’s, for power transformers in the Norwegian market. 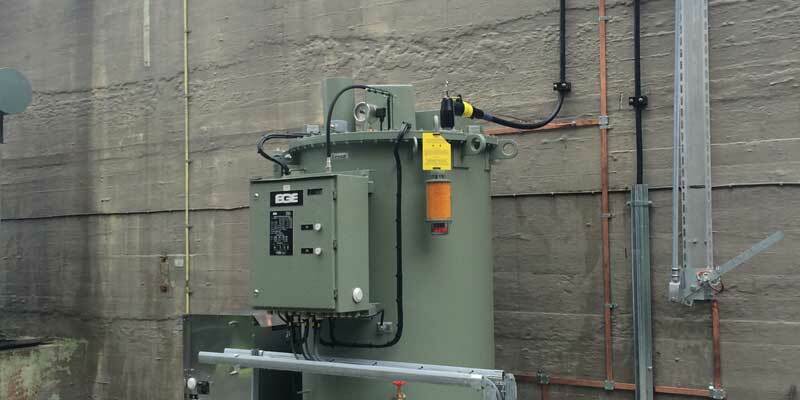 Customer AS wanted to replace the AVR’s for two transformers in the substation to achieve automatic parallel operation determined by the positions of the disconnectors and circuit breakers. This functionality is called Paragramma and can handle up to 3 transformers in parallel. The product itself is called REG-D and can also be delivered with the IEC61850 protocol if desired. Jacobsen Elektro AS delivered a solution with two REG-D + one REG-DP (automatic suppression coil regulator) in common rack, placed in a separate cabinet. Design, installation, testing and commissioning performed to the customer’s satisfaction. Jacobsen Elektro represents products from A. Eberle GmbH and we have delivered over 200 automatic suppression coil regulators to the Norwegian market. In connection with the framework agreement for the protection and control systems, our automatic suppression coil regulators been approved by Statnett for IEC61850 protocol. Statnett has also contributed to developing the product to their requirements, which has been installed to the customer satisfaction on their 132 kV stations. The work has included both product shipments through other companies as well as engineering, installation, testing and commissioning of our own organization. Jacobsen Elektro AS has also provided the customer with engineering, assembly, testing and commissioning of party equipment on coil regulator, where time has been so key that Statnett had to invoke their framework agreement on emergency preparedness. The project consists of a network station with artificial neutral piont, automatic suppression coil, switchgear and communication via RTU with control centers. The switchgear has motorized circuit breakers for two bays and manually operated load switch for incoming voltage. The artificial neutral point can be separated via the fuse isolator. Arc suppression coils, are provided by EGE of the Czech Republic, whom Jacobsen Elektro AS represent in Norway. From this vendor, we have over the last years delivered more than 170 coils. The artificial neutral point and kiosk came from Møre-Trafo AS with the switchgear from ABB. RTU comes from our partner Sprecher Automation in Austria. The project was completed with excellent customer cooperation throughout. Jacobsen Elektro has an agreement with Sprecher Automation for the control systems and RTU. Our customer wanted to control and measure the distributed motorized disconnectors and circuit breakers. In this connection, they signed a 4-year framework agreement for delivery and installation of RTU partial in existing control cabinets and partly delivered as additional cabinets. Jacobsen Elektro AS proposed a solution using existing cabinets where RTUs were mounted with specifications required to meet the standards. Communication with the control center works via radio link, where you can read the temperature, wind, current, voltage and switch position. Commands in / out for the motorized circuit breakers reduces troubleshooting time considerably and gives the customer the opportunity to make changes in the, network; everything done from control center.